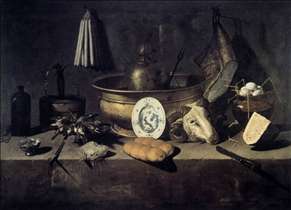 Neapolitan still-life painter, the outstanding member of a family of artists. 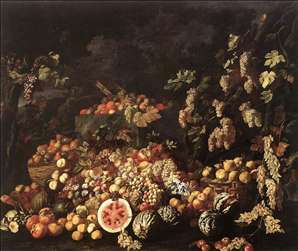 He specialized in pictures of fish, painted in an impressively grand style, but more austere than those of Ruoppolo, with whom he ranks as the most distinguished Italian still-life painter of his period. 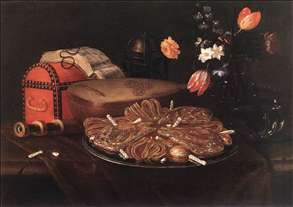 He may have visited Lombardy and may have been influenced by Baschenis, but his works are all in the Spanish realist tradition of the Bodegn painting - some have been attributed to Velzquez - which goes back to Caravaggio. He died in Spain. Three of the family members - Giacomo, Giovanni Battista and Giuseppe - used the monogram G R which causes problems of attribution. Giacomo (1603- before 1653) was the eldest, and was the father of Giuseppe, the most famous of the family. Giovanni Battista (c. 1615-c. 1660) may have been Giuseppe s brother but was more likely his uncle. 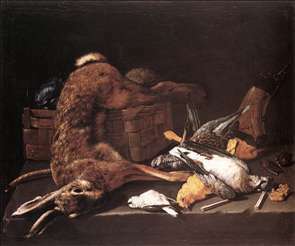 See more details about "Dead Games"
See more details about "Still-life with the Five Senses"
See more details about "Still-Life with a Head of a Ram"